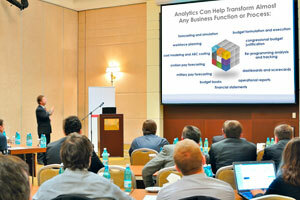 Companies are increasingly turning to analytics to gain a competitive edge. As they do, they must resolve unique demands on their information technology, their structure, their processes, and their culture. Most critical, however, is the challenge posed by analytical talent, the people at all levels who help turn data into better decisions and better business resultsAccenture, "Counting on Analytical Talent"
Neubrain is committed to providing you with the skills and knowledge necessary to get the most out of our IT solutions – and your investment – by attending to the specific needs of your organization. Whether you have a few users or a large department, whether you are training system administrators, developers, or end-users, we customize our training and education sessions to meet your unique goals. Our team of experts provides a variety of training courses. To minimize travel costs and reduce carbon footprint, Neubrain can execute the entirety of a project or any portion of it virtually by leveraging our state of the art cloud-based infrastructure, conferencing utilities, and web-based project management tools and methods. Neubrain classroom training is offered in our Arlington, VA office – one mile from the National Airport, and three miles from the National Mall in Washington, DC. Neubrain training classes can also be conducted at the customer site. In this case, a different price schedule applies. Neubrain offers a series of web-based training events: webinars, training sessions, Q&A sessions, real-time collaborations forums, etc.